Haleakala National Park is located on the Hawaiian island of Maui. The park is located near the town of Hana. In the Visitor Center of Kipahulu tourists can obtain information on the most beautiful places for independent walks in the park. The area where the park is located today, was inhabited by people for hundreds of years. Tourists can learn really interesting details about the life of ancient people in this area. The park has some pristine forest areas that are prohibited for tourists, as there are carried out studies. At the park visitors are offered a hiking trail called Pipiwai, which runs along a picturesque stream. Some tourists like to swim in the water pools formed by the flow, which are located in close proximity to the ocean. But often the flow causes floods that cause injury and even death. Tourists should be prepared that tropical weather is humid, warm to hot depending on the season and prone to sudden heavy rains and winds. Whales, turtles, dolphins and seabirds can sometimes be seen from the shore of the ocean. Due to the heavy sailing conditions, you cannot safely enter the ocean in the area of Kipahulu. In the area, you may camp. Tourists can experience the thrill of romance, but the campsite is not too comfortable. There is no water, but he has barbecues and tables that can be used. Camping is not allowed for more than three nights every thirty days. Lovers of adventure can climb to the summit of Haleakala volcano. The scenery is magnificent with a variety of bright colors. Near the volcano can be seen different birds that live in the park. Haleakala park has many interesting plants and animals. Here live Hawaiian geee, known as Nene. They are threatened by extinction. At the beginning of new era, Polynesians colonized Hawaii. 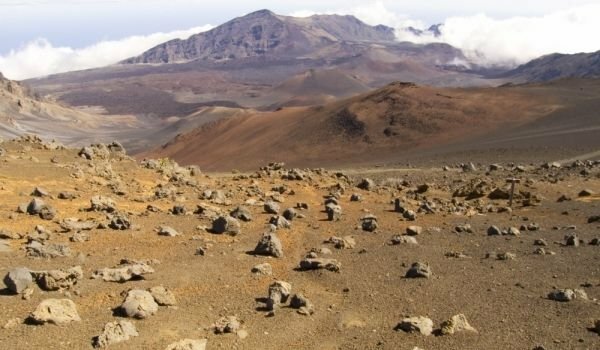 During the period from 660 to 1030, residents of Hawaii use the crater of the volcano Haleakala for their own needs. In 1778, here was made first contact with Europeans by Hawaiians - here came Captain Cook. In the early nineteenth century, American missionaries and whalers arrived in the area. In 1828, three missionaries climbed the summit of Haleakala volcano. In the late nineteenth century, sugar production from sugar cane began in Kipahulu. In 1888 opened Haleakala Ranch and cattle grazed on the slopes of the volcano crater. In the late nineteenth century Nene geese could no longer be found on the island of Maui because the immigrants brought cats, rats and mongoose, and because of habitat destruction of these birds . In 1898 the territory of Hawaii was annexed to the United States, and in 1916, they founded the National Park Hawaii by resolution of Congress. It enters the region of Haleakala. In the thirties of the twentieth century way to the summit of the volcano was made. From 1941 to 1946 was the U.S. military occupation of Haleakala. The park is closed to the public from 1941 to 1943. In the sixties, Hawaii National Park was renamed Haleakala National Park. This is the time when Nene geese came back on the island. In the seventies started fencing in the park to limit the entry of animals, which can disrupt the plant balance in the park. This work continues today.